GET INVOLVED - JOIN OUR LODGE! A man, woman, or youth of good character, who is loyal to his or her country and believes in a Supreme Being, the creator, and preserver of the Universe, is eligible for membership. Odd Fellowship strictly forbids any interference with one's religious beliefs or political opinions. To Join our Lodge, you must be 16 years old. A candidate must be sponsored by a current member, so the first step towards joining is to find someone who is a current member. 1.) Ask people you know if they know anyone who is an Odd Fellow of our Lodge. 2.) Drop in on the day of a meeting about 30 minutes before the scheduled time, and introduce yourself. We are eager to find new members and will be glad to meet you. 3.) 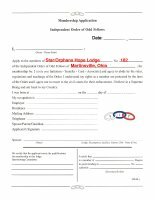 You can write or email the Star.Orphans Hope Lodge No. 182, by going to our Contact Us page by Clicking Here. 4.) You can fill out the Membership Application by downloading, and fill it out and bring it with you. You can Download our Membership Application, by clicking on the Download Button below. Striving to make the world a better place in which to live. The Emblem of the Independent Order of Odd Fellows. Three Links with the letters ‘F, L & T’. To improve and elevate the character of mankind. those unusual people who believed in helping others. The origin is shrouded in the mist of antiquity. American Continent in 1819 at Baltimore, Maryland.